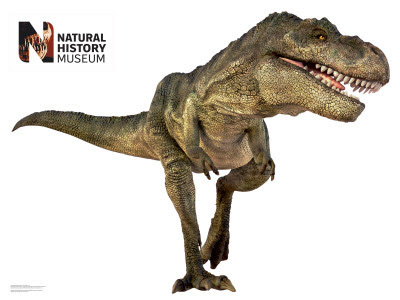 Ah, the Tyrannosaurus Rex. As we all learned in grade school (or during our "I'm gonna be a paleontologist!" infatuation period after repeated viewings of Jurassic Park), its name literally means "tyrant lizard king." Not-at-all terrifying wall decal available here. 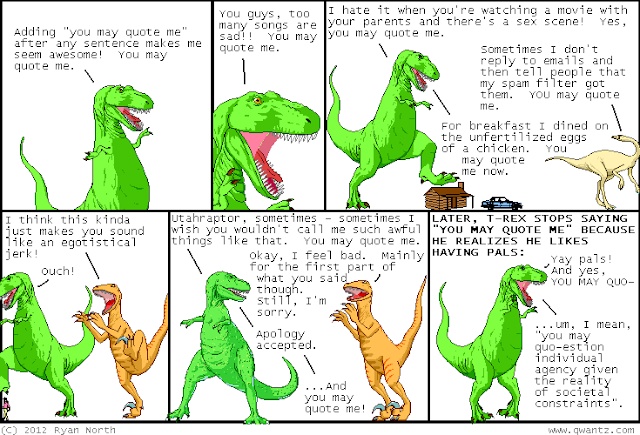 But good ol' T-Rex has also proven to do be something of a tyrant lizard king of comedy, as well. 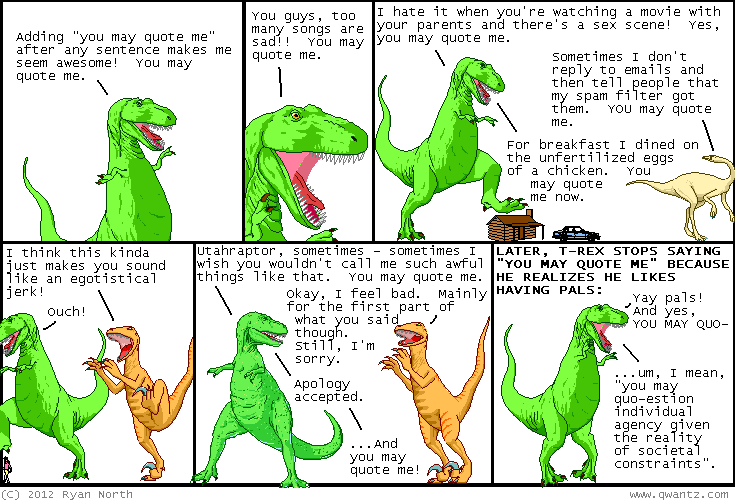 You've probably all seen Ryan North's Dinosaur Comics, a nine-year-old, award-winning humor site featuring a T-Rex merrily stomping on a log cabin while pontificating in funny and often thought-provoking ways to his dino friends. The art stays the same every day. The funny just gets funnier. Brilliant humor site The Oatmeal has also taken on the T-Rex, offering seven reasons why you should keep him off crack cocaine. 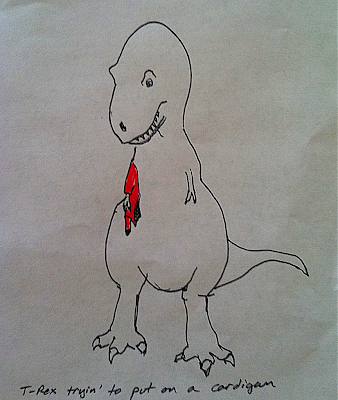 There's now a new comedy lizard stomping around the Internet: T-Rex Trying ... 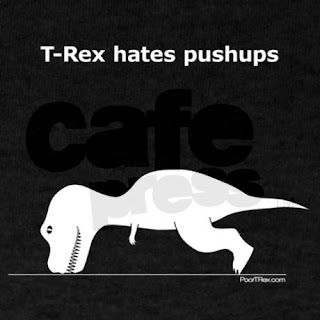 This Tumblr celebrates all the things that the T-Rex, with his tragically comic short arms, just cannot do. It's funny and occasionally heart-wrenching. I've been there, Mr. Rex. I've been there. Teeny tiny T-Rex arms are also fodder for two of my favorite t-shirts. First, we turn to push-ups. A Google search turns up tons of buying options, but this one, by poortrex at CafePress, is probably my favorite. 604Republic takes on T-Rex fights in the Epic Duel t-shirt. Truly, it is a majestic slap battle. Incidentally, my introduction to T-Rex humor came in Gary Larson's late, great The Far Side, perhaps the single funniest comic ever created. I'd include the image here, but Larson has written a heartfelt plea that people not post his work online, and I wouldn't dream of ignoring the wishes of my favorite cartoonist. However, if you do a Google image search for "far side t-rex," you might find someone less respectful than I. It's worth the hunt.